A 28-foot sailboat is at the the bottom of Sarasota Bay after a fire the vessel sunk the ship. Bradenton Police Department believe the cause of the fire is believed to be a lighted canister of Sterno cooking fuel. However, the investigation is ongoing. Reports say that on January 12th, a Bradenton Beach Police Department officer was on routine patrol on Bayside Drive when he observed a boat on fire. The officer contacted the U.S. Coast Guard, but acceding to reports, “by the time the Coast Guard arrived there was nothing they could do.” The recovery was complicated by the fact that none of the agencies that were contacted to assist had a vessel in the area equipped with the specific type of nozzle used to extinguish boat fires on open water. A witness disclosed that he saw what he thought was a candle burning as he was rowing a dinghy toward shore. The witness then stopped to check on the person known to stay on the boat.“When he got there, he opened the door to the cabin and there was a backdraft effect of the air hitting what we believe may have been a lit Sterno can, which will emit fumes in an enclosed area,” the police reported. 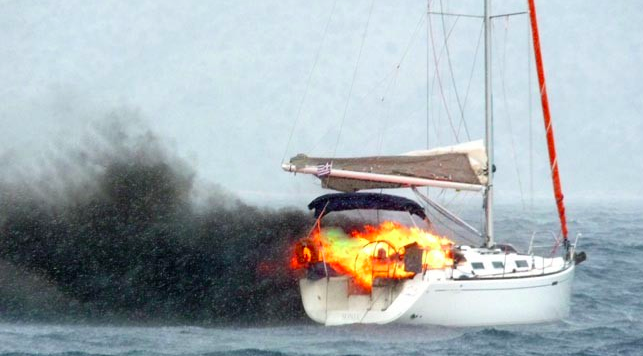 The witness managed to escape without injury, but the sailboat continued to be engulfed by flames and, as it burned, the fire spread to the anchor ropes, which freed the burning vessel and allowed the burning boat to make contact with another boat, causing some exterior fire damage. Law enforcement said the fire is considered suspicious in part because there is some question whether the boat was in the process of changing owners. In our experience, boating accident cases are usually complex and require a thorough investigation to determine how the accident occurred, and who is at fault. Whittel & Melton represents Hillsborough, Pinellas and Sarasota county victims injured on wave runners, sailboats, motor boats, fishing charters and casino boats and aggressively fight insurance companies and other wrongdoers to obtain fair and just settlements for our clients. If you or someone you love has been injured in a watercraft accident, it is imperative that you contact a Sarasota boating accident attorney who can explain what you are legally entitled to under the laws of Florida. Our attorneys are available 24 hours a day, 7 days a week. Call us toll free, (866) 608-­5529 for free consultation.